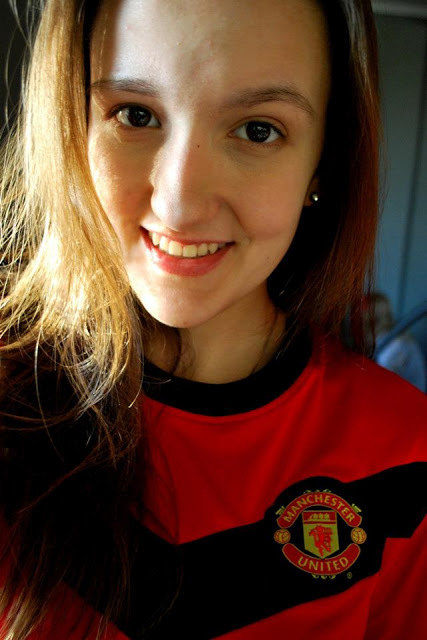 We asked Marysia Bastek several questions about her love to Manchester United. Marysia (16) is from the north of Poland and she is fan of the club since 2007. Her support to the club began when she started to watch games with her older brother who was a fan of the Red Devils. Many supporters of the club said the Robin Van Persie is their favorite player this season, but Marysia's favorite player is Carrick. Cantona is the best player that Manchester United had in its history. Is there anyone who wants to take Marysia to a Manchester United match? Marysia wasn't yet in a match of the club. What is the best memorable moment you had with the club? "When Manchester United won the Champions League trophy. It was amazing, I was crying all night then"
What do you think about Alex Ferguson? "He is the best of all managers. I love him like my father"
Marysia would like to bring back Christiano Ronaldo to the club - "I would bring back Ronaldo because he is the best and I miss him so much in our team"
"Manchester United are family. They love what they do. They have a great history and makes me proud. Simply amazing -That's what can I say"